We can all agree that position of your implement is pretty important. Those guess rows with variable widths in your stand are not only annoying to see, but they are also costing you money in lost yields. Even after your guidance measurements are double-checked and steering components are calibrated properly on the tractor, where is your drawbar implement going to be when you drive the side slope? Don’t wait for the crops to tell you where the implement was, put it where it needs to be the first time. 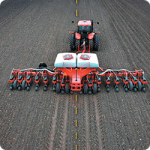 The Trimble TrueGuide system controls the tractor to help maintain the implement on the guidance line. Designed for broadacre applications, TrueGuide can reduce implement drift by over 50% from relying on the operator/driver alone. NOTE: TrueGuide is a passive implement-steering system, meaning that there are no components added to the implement or the attachment point that would directly influence the implement’s motion. For active implement steering in row-crop applications, check out the TrueTracker page.